Finally managed to locate some Plastruct "angle iron" for the narrow footplate along each side of the tender. I didn't get chance to call at Haslington Models last week because I was too busy at work and when I stopped by on my way back from Crewe on Monday morning this week I discovered that he's not open until Thursday. No matter, on Tuesdays the van round takes me through Alsager so I called in at the model shop there instead. Number 9 is now almost ready for service. I just need to do something about the driver's legs. Full story on my blog. PS - Just uploaded a film to Youtube. The noises heard are actually those made by the train, but slowed down. I like the clanking as the train coasts over Jones River bridge, as if the loco's motion is in need of some tightening up! 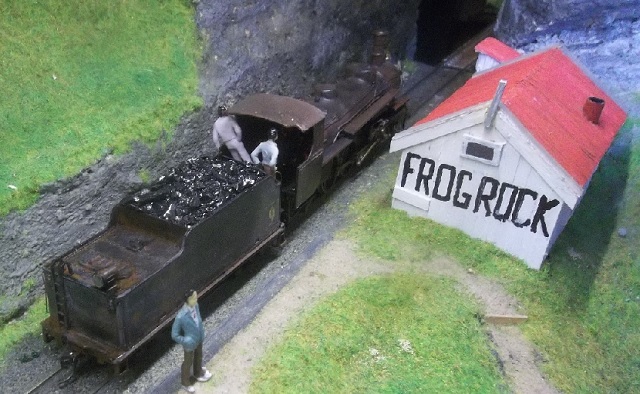 Also the squeal as the train passes through Frog Rock, could that be the couplers tightening as the conductor applies the caboose's hand brake ready for descending into Cuarto de Pulgada?